Dehradun/New Delhi: Despite rain and overcast skies today, military helicopters continued rescue operations in Uttarakhand today. 11 days after the monsoon struck the hilly state with torrential rain, nearly 6,000 people remain stranded. Nearly 90,000 people have been rescued in a heroic and vast rescue operation led by the military. Minutes after the crash, the Air Force said its rescue operations will continue. Late night reports said that Air Chief Marshal NAK Browne is likely to visit Dehradun and Gauchar to boost the morale of his personnel in the state. The death toll in the disaster has crossed 830 now. More than 120 bodies were found earlier today in Kedarnath, which was the worst-hit area.Home Minister Sushil Kumar Shinde has warned that as flood waters recede, the full extent of the tragedy will be revealed, and the death toll could cross 1 ,000. Today's rescue operations focused largely on the nearly 5,000 people who are stranded in and around Badrinath. They are safe because they are in relief camps equipped with food and water, but cannot leave the area as landslides have cut off access to major roads leading to Dehradun and Rishikesh, from where they could be sent home. Congress vice-President Rahul Gandhi spent the night at a base camp in Gauchar last night and visited a relief camp at Guptakashi today. He arrived in Uttarakhand on Monday as Home Minister Sushil Kumar Shinde warned that visits by VVIPs impede rescue operations, and that political leaders will not be given landing rights. 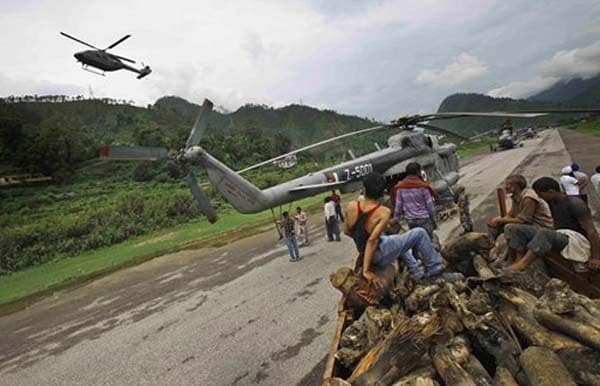 For the first time today, the Air Force was able to land a big helicopter - the Mi-17 - in Kedarnath to drop off firewood and other material needed for a mass cremation for the hundreds of bodies found here. Officials are worried about the decomposing bodies causing an outbreak of diseases. Local priests will supervise the last rites.